I hung this viny pattern back in the early 2000’s in dining room in the West U neighborhood of Houston. Now that it’s time for a change, I got to strip off what I had hung 20 years ago. I was amazed at how easy it was, and at how there was NO damage to the walls. To lessen the chance of putting stress on the seams, I used a sponge to put water on the surface of the paper. Because it was paper (not vinyl), water was able to penetrate, and reactivate the paste that was holding the paper to the wall. I made many trips around the room, soaking the paper each time. The more water that was able to soak into the paper, the softer the paste became, and the easier it was to pull the paper away from the wall. Usually, the inked top layer of paper separates from the paper backing, and then you sponge water onto the backing layer, which reactivates the paste and then it comes away pretty easily. But in this case, the top and backing layers stayed together, and came off in one intact piece. This virtually never happens. Note that I am pulling down, and not away from the wall. Pulling downwards minimizes stress on the wall. And I am pulling slowly and gently – not yanking. What’s better – there was absolutely NO damage to the walls. Not one bit of primer pulled away from the surface, not one seam gave way, nothing to patch. Why? Because when I prepped these walls 20 years ago, I did a proper job. I skim floated the textured walls to smooth them, removed all residual dust with a damp sponge, then primed with oil-based KILZ Original – great stuff, for many reasons. It holds tightly to the surface, it won’t rewet when water is sponged on the surface, it’s strong enough to resist double-cutting (strokes with a razor blade), it dries thin and smooth, and much more. I wish I could still use KILZ Original. It was a superior primer for wallpaper (as well as stain-blocker). Unfortunately, EPA regulations have required manufacturers to make changes to their product, and wallpaper paste will no longer adhere to it. I’m using alternatives now, and am pleased with the results. …Although I have not had experience stripping paper off these new products, so time will tell about that. 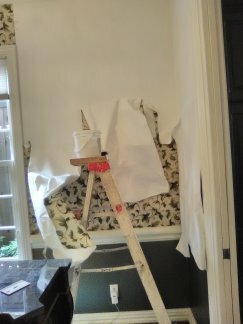 But these photographs of my experiences yesterday show what a superlative product the original KILZ Original was, and how important it is to take the time to prep a wall properly before hanging wallpaper.